You can tell a lot about a culture through its proverbs. Italians say that while sharing a table with family and friends, one does not grow old. And rather than kill two birds with one stone, Italians feed them with one bean. Creating, sharing, and eating food is tantamount to life and love in Italy. Knowledge, necessity, and anticipation unite, merging past, present, and future to nurture body and soul. The bountiful Italian table urges one to pause long enough to inhale the scents of the season’s harvest and feel the heartbeat of the day. To break bread is to forge bonds. Fortunately, breaking bread is universal, and I was lucky enough to be raised by a mother who understood the soul-warming effects of homemade bread. I still remember the drums of whole wheat we hauled home from her parents’ far-off farm. Wheat that was cracked into wholesome bits, baked into russet loaves, and devoured in inch-thick, steaming slabs. When I left home at 17, I also left behind the luxury of homemade bread. Living in a dorm while attending college, a VW van while following the Grateful Dead, a backpack while hitchhiking Europe, and a camper while working in the circus were not conducive to baking bread. When I found my way back to Oregon, Italian husband who Cannot Eat Without Bread in tow, I forayed into the yeasty world of bread baking. But the only way it was going to work was if I could make good, failsafe bread. Running two businesses from home meant it had to be easy. And spontaneous entertaining meant it had to be quick. I’ve tweaked a handful of recipes over the years to meet our needs, everything from Simple as Sunshine Focaccia to Low Carb Cranberry Walnut Bread to Chewy Italian Bread, our current favorite, and the recipe I’ll be sharing today. I would prefer to have more pictures, but I’m still without my desktop, AND I’m publishing this while selling at Eugene’s Saturday Market. Hopefully I get that darn computer back this week. According to the Italians, Pan di sudore, miglior sapore. Bread you sweat for tastes better. I agree. Yes, you can make good homemade bread, and, with a little prep work, you can make it in a flash. If you have a handy dandy Kitchen Aid or similar mixer, you can even make it without the sweat! The following instructions may seem long, but once you’ve done it a few times, you’ll be able to whip up lovely loaves of bread in no time. You’ll need 5 minutes to start your sponge (biga in Italian) and 20 minutes a few hours later to prepare the dough. Then, when you want to bake your bread, all you’ll need is the time to warm an oven and bake it, a total of 30 minutes to 1 hour depending on your method. You can bake this bread in a regular oven just fine. A pizza stone will help make it crusty, but you can also make do with a cookie sheet. I bake my bread in a gas barbecue. It heats in 12 minutes, bakes in 17, and it produces the closest I’ve come to wood-fired bread at home. Since I bake bread a few times a week, year round, another benefit is keeping all that heat outside during the summer. You’ll definitely need a pizza stone for this method, which you can find at almost any store with kitchen gadgets. Maybe I’m clumsy, but I find these store-bought stones too thin and too flimsy (and expensive to replace). After destroying 3 of them in my first 6 months of bread baking. I finally made my own heavy-duty stone by purchasing oven bricks at a local building supply store and fitting them into a sturdy cookie sheet. The whole thing cost me less than half what a single mass-produced pizza stone runs. Pour your warm water into quart glass or Tupperware container and sprinkle the yeast on top. Once the yeast is dissolved, mix in the flour. This will make a dryish mix, and I don’t fuss over getting every last bit of flour mixed in. Once the water is absorbed and the flour clumps, much like biscuit dough, I call it done. This process shouldn’t take more than five minutes tops. The biga will be ready to divide and mix into dough after left for a few hours in a warm spot. If it’s cold, let it sit a little longer. If you won’t be making bread for a day or so, leave it in the refrigerator where it can stay for 10 or so days. If you only want to make the starter for one loaf at a time, use ¼ t yeast, ¼ cup water, and ¾ cups flour. Pour ½ cup of the water into a bowl, sprinkle the yeast on top, and let it dissolve. I sprinkle on ½ tsp. at a time to avoid clumping the yeast and slowing the process. In a bowl (your mixing bowl if using a Kitchen Aid type mixer), add 1 portion of biga, 2 tsp salt, ½ cup water, and enough of the flour to keep the water from sloshing all over your kitchen. Use the paddle attachment to mix the biga into the flour and water. (If your biga has been in the refrigerator for a day or more, it will be dense enough to remain in its own little lump. Make sure it’s merging with the rest of the dough.) If you’re mixing by hand, time to get your fingers gooey. Once the biga has merged with the flour and water, add the remaining flour, the yeast and water mix, and the remaining ¼ cup water (which I use to rinse the last of the yeast/water out of the bowl I dissolved it in). When it’s well mixed, switch to the bread hook and mix for 10 to 15 minutes. If you’re doing this by hand, keep the dough in a bowl for as long as you can. Eventually, you’ll have to put it onto a board, but it needs to remain moist (and therefore sticky), so be careful not to add too much extra flour on the board. A scraper will help you turn the dough. In the mixer, if I notice that the dough completely slumps to the bottom of the bowl, I add up to 1/4 cup more flour. 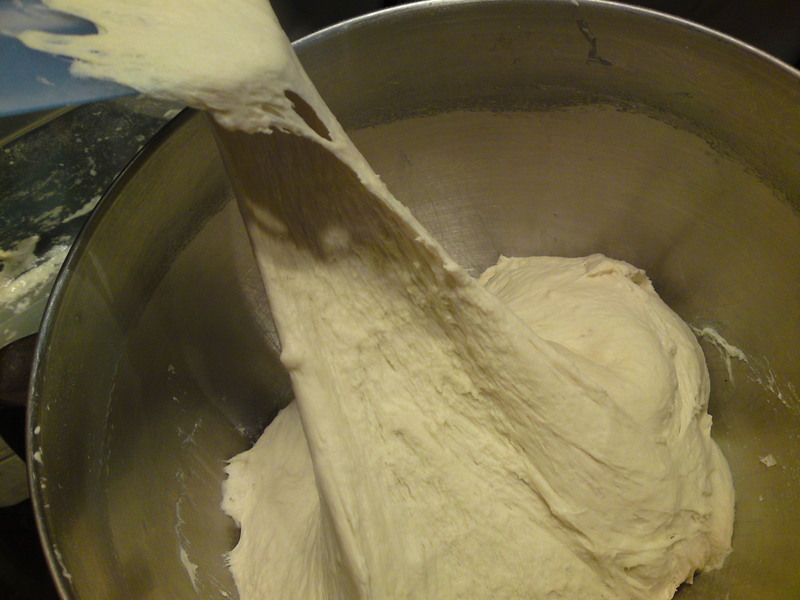 You want to end up with a smooth, soft dough that is elastic enough not to break when you stretch it. Tip: to be able to have bread ready on short notice, I usually make a double batch of dough at once, using 2 portions of biga (half of the recipe at top), 4 tsp. salt, 2 ½ cups water, and 5 ½ cups flour. Once the dough is mixed I put half of it in a glass or Tupperware container and leave it in the refrigerator for up to a week or so. When it’s time to bake it, I start the oven or barbecue heating, plop the cold dough onto a floured cutting board, stretch to shape, and cook as usual. Once the dough is blended, divide if you’re making multiple loaves. Refrigerate if you’re not going to use that day. If you are baking one the same day, splash a teaspoon or so of olive oil into the bowl, flip your dough around to coat it and the bowl, cover with plastic wrap, and let rise until double, usually 2 -3 hours, depending on the temperature of the room. (If you’re in a hurry and your oven has a bread-rising feature (+/- 100 degrees) you can cut the rising time in half. 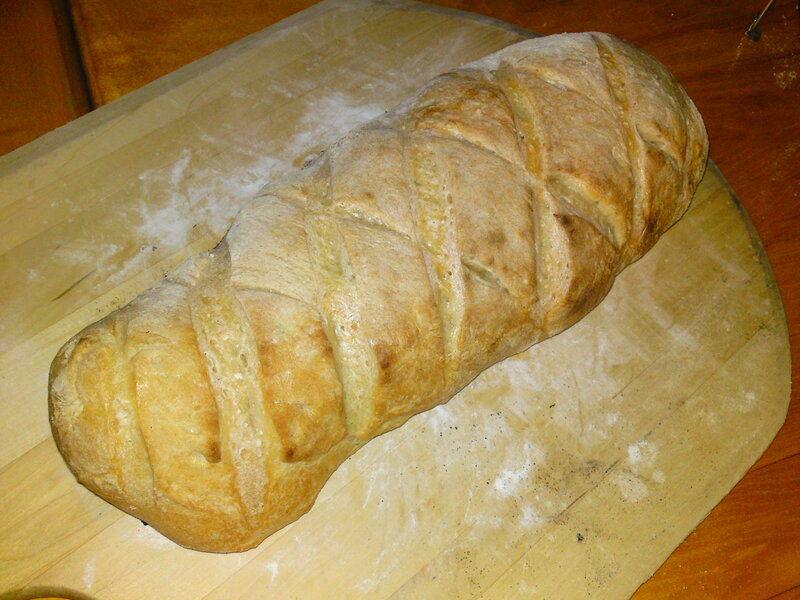 Turn the raised bread onto a floured board and stretch into an oblong. I use a pizza peel, but a cutting board works just as well. Let it rest for as long as it takes your oven or barbecue to heat to temperature. To fancy up your finished product, try making shallow diagonal slices with a sharp knife. This works best when using chilled dough. Tip: for a wonderful smoky, wood-fired oven flavor, try adding a few sticks of hardwood to the edges of your grate. Again, gauge when they should be added and where they should be placed by the temperature and size of your barbecue. Tip: to make your bread even crustier, spritz the partially-baked loaf with water a few times during the baking process. This works for both oven-baked and barbecued loaves. To bake in the oven: preheat pizza stone to 425 for at least 1/2 hour (while bread is rising on cutting board or peel). Using a spatula to gently loosen the dough from the board, transfer to preheated stone and bake for 30 – 35 minutes. Again, exact baking time depends on your oven. Cool on rack to maintain crust and mangia! mangia! mangia! Rosemary Bread: Saute a few sprigs of fresh rosemary in ¼ cup olive oil. Add the oil while mixing your loaf. Chop the sprigs and add them as well if you’d like more flavor. Olive Bread: Add 1 cup or so drained, dried, chopped, and pitted olives while mixing dough. Whole Grain: My husband is not fond of whole wheat bread, pane integrale in Italian, so I usually don’t experiment with different flours. But there’s no reason why you shouldn’t. I wouldn’t start with 100% whole wheat… maybe 50%, and then play with the ratio to find the balance between whole grain and chewy texture that pleases you. What wonderful variations to add pizzazz to your bread. The walnut bread sound just wonderful. Fantastic! Description is delightful. Will wait for pictures and then perhaps give it a try. I must do this! Carbs be damned! Can you provide details or a pic on the home-made pizza stone? Our big round stone doesnt even fit in the grill, and Jill would kill me if I started shattering her stones. Will do Timothy. Easy as pie to make. Love to hear how it turns out! I’m the lucky one that has to EAT them all every time…..